David Drum is the co-author of two nonfiction books listed below. Both books combine health writing with writing about war and its effects. In 1968, as the war in Vietnam raged, an idealistic young American doctor volunteered for an American Medical Association program to help Vietnamese civilians, and stepped into a nightmare. 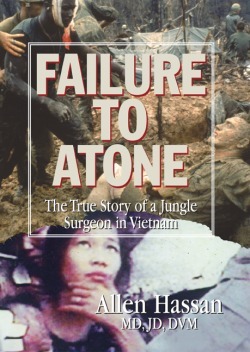 Failure to Atone: The True Story of a Jungle Surgeon in Vietnam, by Allen Hassan, MD, JD, DVM, and co-written by David Drum, is the story of one medical doctor's astounding odyssey into the killing fields of Vietnam during the worst days of the Vietnam War. “Hassan witnessed American military personnel attacking innocent civilians, soldiers so severely wounded that they were not sent back home for fear of demoralizing the public and undercutting support for the war, the remains of a South Vietnamese soldier brutally executed for desertion while an American commander looked on, the remains of babies slain execution-style, and much more. A haunting read, every page poignantly real, and a cautionary tale against the worst that nations are capable of." 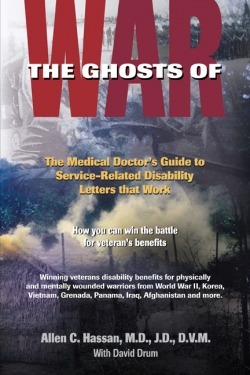 THE GHOSTS OF WAR: The Medical Doctor’s Guide to Service-Related Veteran’s Disability Letters That Work, by Allen C. Hassan, MD, JD, with David Drum, was released on July 4. This is a book with a mission. The mission is to help America’s military veterans get veterans the service-related disability benefits that they deserve. Service in the military is dangerous in many ways. Even in peacetime, the stressful and sometimes dangerous demands of military service often result in health problems later in life. Taking care of these veterans is the mission of the Veterans Administration. Unfortunately, as a result of the long and tedious VA claims process, many deserving veterans don't get the service-related disability benefits to which they are entitled. The Ghosts of War explains how the key to receiving benefits for service-related injuries or disabilities is to establish a connection between medical problems which began in the service and the veteran’s current medical condition. If a link is clearly demonstrated by the examining physician, and proven to the satisfaction of VA claims evaluators and its appeals process, the veteran will ultimately win his or her claim for benefits. A medical doctor as well as a lawyer, Dr. Allen Hassan’s medical evaluations have won benefits for more than 3,000 military veterans over the years. The Ghosts of War, co-written by David Drum, is the first book of its kind. It includes the complete text of written evaluations which have won benefits for American military veterans from every major conflict since World War II, including Korea, Vietnam, Bosnia-Herzegovia, Panama, Iraq, and Afghanistan as well as successful evaluations for veterans who were injured or disabled in non-combat situations.